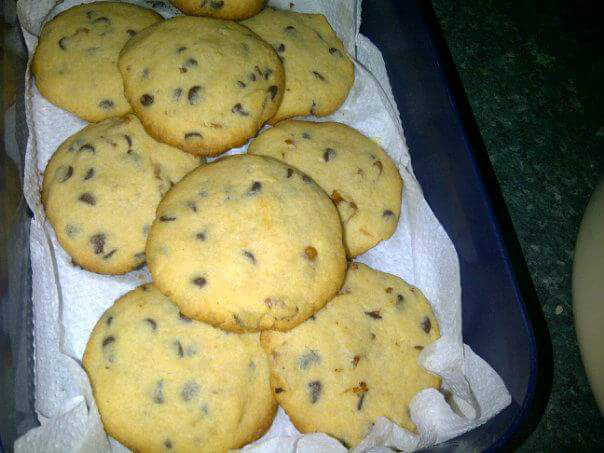 Pecan and chocolate chip cookies, perfect to eat at any time. Cream butter with sugar till light and fluffy. The colour of the mixture should be pale. Add salt, milk, vanilla essence and flour and mix well. This will form a dough and should no longer be sticky; it will become possible to shape it into a ball without the dough falling apart. Add chocolate chips and nuts to the dough. Shape the dough into medium sized balls and use your fingers to flatten the balls into 5-7 mm thick cookies. Place on a baking tray and ensure a 4 cm gap between each cookie. Bake for 45 minutes till golden.